Astronomers using ESA's XMM-Newton space observatory have probed the gas-filled haloes around galaxies in a quest to find 'missing' matter thought to reside there, but have come up empty-handed – so where is it? All the matter in the universe exists in the form of 'normal' matter or the notoriously elusive and invisible dark matter, with the latter around six times more prolific. "This has long been a mystery, and scientists have spent a lot of effort searching for this missing matter," says Jiangtao Li of the University of Michigan, USA, and lead author of a new paper. "Why is it not in galaxies – or is it there, but we are just not seeing it? If it's not there, where is it? It is important we solve this puzzle, as it is one of the most uncertain parts of our models of both the early universe and of how galaxies form." 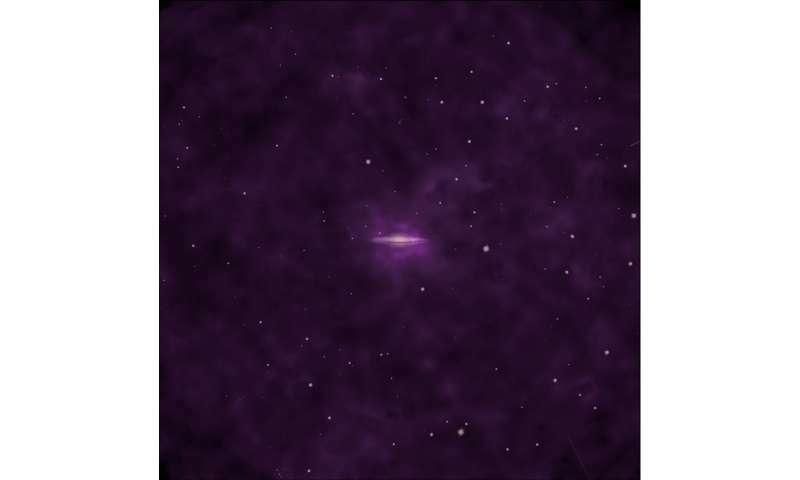 Rather than lying within the main bulk of the galaxy, the part can be observed optically, researchers thought it may instead lie within a region of hot gas that stretches further out into space to form a galaxy's halo. Jiangtao and colleagues wanted to measure the hot gas out to larger distances using ESA's XMM-Newton X-ray space observatory. They looked at six similar spiral galaxies and combined the data to create one galaxy with their average properties. "By doing this, the galaxy's signal becomes stronger and the X-ray background becomes better behaved," adds co-author Joel Bregman, also of the University of Michigan. The team's results showed that the halo surrounding galaxies like the ones observed cannot contain all of the missing matter after all. Despite extrapolating out to almost 30 times the radius of the Milky Way, nearly three-quarters of the expected material was still missing. "This work is important to help create more realistic galaxy models, and in turn help us better understand how our own galaxy formed and evolved," says Norbert Schartel, ESA XMM-Newton project scientist. "This kind of finding is simply not possible without the incredible sensitivity of XMM-Newton." "In the future, scientists can add even more galaxies to our study samples and use XMM-Newton in collaboration with other high-energy observatories, such as ESA's upcoming Advanced Telescope for High-ENergy Astrophysics, Athena, to probe the extended, low-density parts of a galaxy's outer edges, as we continue to unravel the mystery of the universe's missing matter." Isn't asking about "missing matter" the wrong question? Isn't, "where's the missing mass" more to the point? After all, mass isn't matter (though all matter has mass). Zwicky was a freakin' genius. 85 years ago he comes up with an answer to a problem which can never be directly observed or disproved and scientists are STILL looking for it. And even Zwicky rejected the idea of dark energy... wow... now that's saying something about that theory. Well they're not looking for dark mass are they? Dark matter is more specific because the missing mass cannot exist only where the current matter is observed in the galaxy, there "must" be unobservable matter occupying space which possesses the missing mass. "Maybe Gravity Isn't the Primary Driver?" That's heresy! It's already been decided we live in a gravity only Universe, everything happens because of gravity. .......but no allusion as to WHY the galaxies DO NOT contain ENOUGH missing matter. What's wrong with these cosmologists? They INVENT a fictional narrative out of NOTHING & then fail to comprehend why they're unable to find EVIDENCE for it. They need to consult with Hillary Clinton, she's good at doing the same things with her Steele Russian Collusion dossier. Holy smokes, it just dawned on me, maybe this is where they're getting their ideas from? Or maybe she gets her ideas from cosmologists? After many years of searching for missing mass and not finding it, perhaps it is time to conclude that this missing mass is not missing, it was never there. Were do you people come from? I just can't imagine a real human being acting like Benni or cantdrive85 or dogbert and being self-sufficient. Yes, I believe we are looking for something and that it appears to be massive. IMO I Still think the missing matter is molecular hydrogen H2 very stable not to be confused with atomic hydrogen not very stable. We know, we know you can't live life without having at least one surreal fantasy. Strange how so many people are like that. The Big Bang is a false, creationist concept, Molecular Hydrogen accounts for the missing matter,and doppler effect in a non -expanding, unlimited Universe. The only missing matter is that of the gray variety. It's missing from those who proclaim there is missing matter and their acolyte cheerleaders who wholeheartedly believe in faerie dust. It would be amusing if it weren't so expensive to find that which is not there. Having access to the internet, being literate, and believing the world is out to get them because they are too smart is no evidence of self-sufficiency. [Were do you people come from? I just can't imagine a real human being acting like Benni or cantdrive85 or dogbert and being self-sufficient. I know, exactly. Too bad the internet extends into parent's basements. We know, we know many can't live life without having at least one surreal fantasy. Strange how so many people are like that. Try as hard as many of us do to bring the occult groupies into the normal think mode of real science, there will always be those who can't make the trek, we call them overage Trekkies. My cosmology is taken from both the Hebrew and Greek text of the Bible as well as the current events in science. In my understanding, quasars produced the first Hydrogen as well as antihydrogen. The jets spewed in opposite directions sending matter and antimatter in totally different directions at the speed of light. Quasars rotate in two opposite directions at the same time. This could also solve the riddle of entanglement as well as different universes. This article isn't about dark matter. This is your New Clue™. Please make sure to read the operating instructions before attempting to utilize your New Clue™. If you are unable to understand the operating instructions, please consult with an authorized Fact Dealer™ in your local area for assistance. Your New Clue™ is sharp, and if you try to use it without obeying the instructions, you may cut yourself. Welcome to competition of mindless. The accelerated expansion of the universe was first observed in the '90s and the idiom "dark energy" come from this observation. It was not a subject before... Zwicky was way gone then. .........it's about UNDARK matter, once in awhile you get something right schneibo. Moving right along, the paper makes it clear that a substantial amount of baryon mass must be present in the intra-cluster medium, a fact the paper does not take into account. The paper only says that the mass inside the virial radii of the studied galaxies cannot account for the baryonic mass (that is, non-dark matter mass) when combined with the galaxy masses involved. is dark matter dark because its not illuminated ? The paper only says that the mass inside the virial radii of the studied galaxies cannot account for the baryonic mass (that is, non-dark matter mass) when combined with the galaxy masses involved. Yeah, right Schneibo, it says anything YOU say it says. Now go find some reality & stop imagining the BMI you see in that full length mirror is dark matter. No, she gets her ideas from the climate change people...Easy proof. She continues to spout theories that have been proven false. * Ob. Disclaimer: I do agree that global temperatures rose in the twentieth century, and that whether or not it is good for the climate, CO2 is bad for human beings. (And SO2 is worse.) But I am a statistician, and I have never seen worse garbage than some of the climate models published by the IPCC. The only thing a bad model proves is that someone is bad at creating models. But I am a statistician, and I have never seen worse garbage than some of the climate models published by the IPCC. The only thing a bad model proves is that someone is bad at creating models. You may be on to something else entirely appropriate to this missing Cosmic Fairy Dust article. It's all about: here a little, there a little, over there a lot, under there not so much, up there more than we can imagine, and it all adds up to 95% of nothing. ....Ok, how's this: BMI adds to body mass, body mass leads to more gravity.......gravity is mass dependent. You realize how stupid that sounds? How does an indexing methodology add gravity? If so, give your reasons why and a possible fix. Wow... Flair for the obvious much? It's a massive problem. But does it matter? "Curiously, scientists studying nearby galaxies in recent years have found them to contain three times less normal matter than expected, with our own Milky Way galaxy containing less than half the expected amount." Not sure why some people are talking about dark matter in the comments. Valid question. It's called "dark" because we really have no clue what it is, perhaps it's not even matter. Most politically correct would be "unknown extra gravity causing stuff" where "stuff" likely is, but doesn't necessarily mean matter. "All the matter in the universe exists in the form of 'normal' matter or the notoriously elusive and invisible dark matter, with the latter around six times more prolific." .........because we have better reading & science literacy skills than you do. Thank you AllStBob for a succinct explanation of the problem. No, that's an effect of Gravity. No, that is Electro-Magnetism. And that over there is either centripetal or centrifugal acceleration. None of which are Attractant Gravity. Nope, until you actually find those 'damnable, elusive' gravitons? Verified and confirmed by multiple experiments. I will remain of the opinion that something else. Some previously unrealized, unexpected phenomena is occurring. Hey! Wait a light-minute. That sounds a whole lot like that poorly labeled Dark Matter watchamacallit. Now that is all too obvious. But this particular study only focused on finding the 'normal' matter which I'd think you'd be excited about since you do not support dark matter theories. I think your triggered Benni at the mere mention of Dark Matter even if this scientific study isn't about Dark Matter. You need to learn how to filter out your triggers and stick to the topic at hand. Hey, I'm not the one who wrote the Article, I'm simply responding to THEIR words. If you have a beef with their written words, then take up up with the author, all I'm doing is quoting him. "Baryon Budget of the Hot Circumgalactic Medium of Massive Spiral Galaxies." Is dark matter baryonic? Therefore, is this paper anything to do with DM? Hopefully that's cleared things up for the hard of thinking amongst us. It took 30 years to find the neutrino, give it time they'll get there eventually. alternative title, is "dark matter" becoming politically incorrect among astronomers? A hyper-dimensional galaxy would provide its own dark matter. This would be "normal" matter, hidden in other physical dimensions/ reference frames, that exerts cross-dimensional gravitational influence via the hyper-dimensional space/time continuum. By the same token, the portion of a galaxy that we are able to perceive (such as our own solar system) acts as "dark matter" for extra-dimensional portions of the galaxy which we cannot directly perceive.